In this book Parag Khanna guides us through the emerging global network civilization in which mega-cities compete over connectivity more than borders. His journeys take us from Ukraine to Iran, Mongolia to North Korea, Panama City to Dubai, and the Arctic Circle to the South China Sea—all to show how 21st century conflict is a tug-of-war over pipelines and Internet cables, advanced technologies and market access. I found Connectography invaluable and compelling reading. Order Connectography today and receive an exclusive gift: two free posters featuring some of the book's most revealing maps. There's a limited supply, so submit your order information here and claim yours before supplies run out! In the 21st century, trade flows compete with military power as a means of influence. China is the top trade partner for twice as many countries as the United States, and is gaining more leverage over them. One of the greatest geopolitical changes of the 21st century will be climate change.The entire population of the Arctic region today is less than 4 million people but it could boom to 400 million within the coming years. This map from The British journal New Scientist outlines which geographies will produce the most food if temperatures rise 4 degrees Celsius. Beware of straight lines on maps. Africa, which has more straight lines than any other continent, was not divided based geographic or cultural factors but by European countries' bargaining power. This map shows the lingering armed separatist movements and zones of autonomous control within the continent and displays the limits of our current political maps. 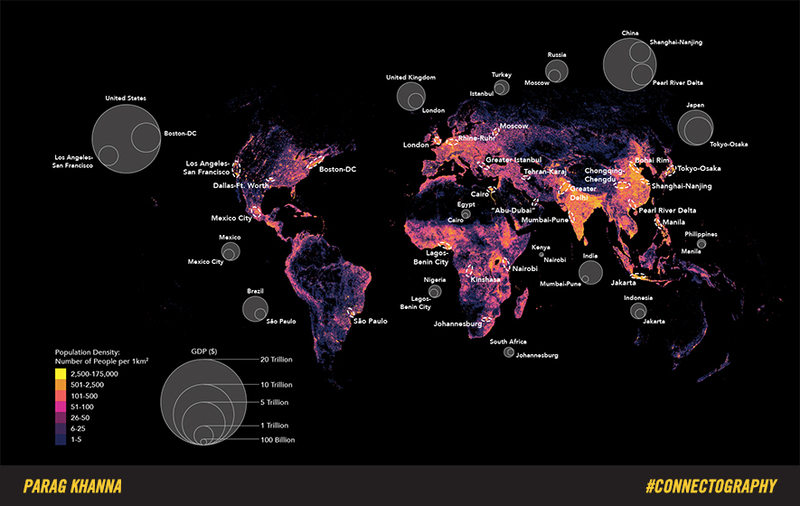 Mega-city clusters dominate the world economy. In many countries, the capital city or financial center often represents up to half or more of the national GDP. By 2030, we could have as many as 50 such urban hubs anchoring the global system. North America is evolving beyond the NAFTA trade agreement into an integrated mega-continent of shared resources and infrastructure. 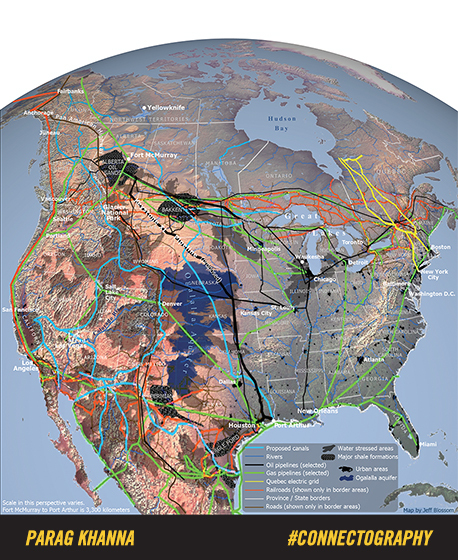 Pipelines, railways, electricity grids and eventually hydrological canals all embody the deeper unity emerging across Canada, the US and Mexico, which together form an energy, water, industry and agriculture superpower spanning the Arctic to Central America.